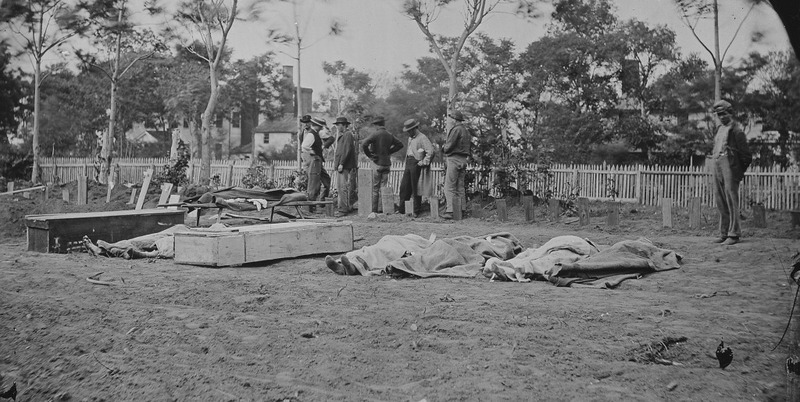 It’s one of the Civil War’s most poignant series of images: photographs of a burial crew in Union-occupied Fredericksburg in May 1864. The men they inter are casualties of the battle of the Wilderness and, possibly, of Spotsylvania Court House as well. I can’t imagine a more powerful visual accompaniment for reflecting upon the war during the final weeks of its sesquicentennial. And I can’t imagine a more compelling mystery: in Grant and Lee: the Virginia Campaigns 1864-1865 (1983), historian William A. Frassanito noted that identifying the location of the series remained to be accomplished. I’ve studied the set of photos intermittently but closely since 1989, and shared interpretations of it in 1995 in a book and, three years later, in an article in the November-December 1998 issue of Military Images magazine. Although I still believe that the site that I identified and published in 1998 is the correct location for the series, much of my experience in reaching that conclusion (and in discarding the theory I had published in 1995) illustrates the limited shelf-life of my own historical interpretations. 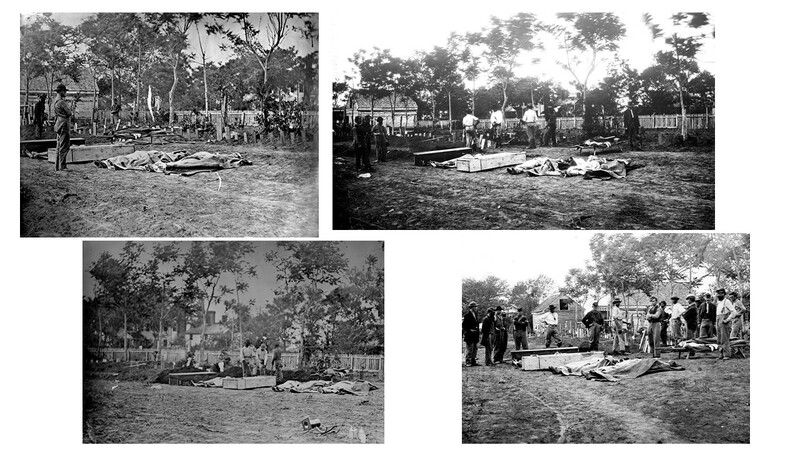 At least two rows of new graves and headboards are shown, as well as bodies awaiting interment. Frassanito attributed the camera work to Andrew J. Russell and at least two photographers employed by Brady & Company, and dated the seven images to May 19 or 20, 1864. Early prints bore the caption “Burying the Dead,” or variations on those words (and on the army-affiliation of the soldiers being interred); the series would occasionally be misdated to December 1862 when its component photos appeared in books predating Frassanito’s. Frassanito was unable to locate the site of the temporary cemetery but noted that the large house that appears in the background could be essential to the search. He speculated that it may have been demolished sometime after the war. Inspired by Grant and Lee’s challenge, and more hopeful of the survival of the house, I eventually developed some ideas about its identity and thus about the location of the burial photos. 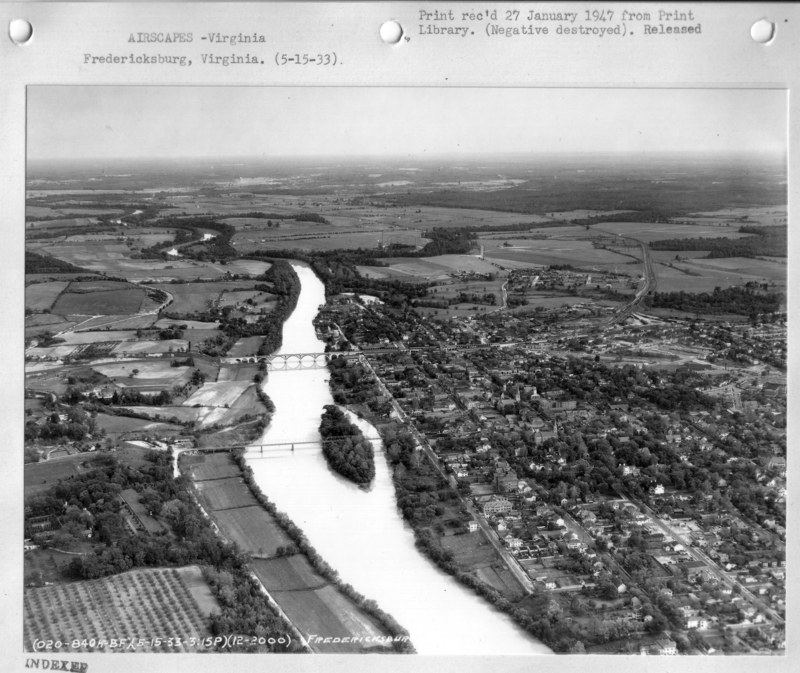 No, it’s not a period photograph, but rather an aerial view taken in 1933. It came to us today, thanks to one of our regional landscape architects, Eliot Foulds, who was poking around the National Archives and came across a collection titled “Airscapes.” This was a project of the Army Air Corps that produced low-level aerial views of important places. 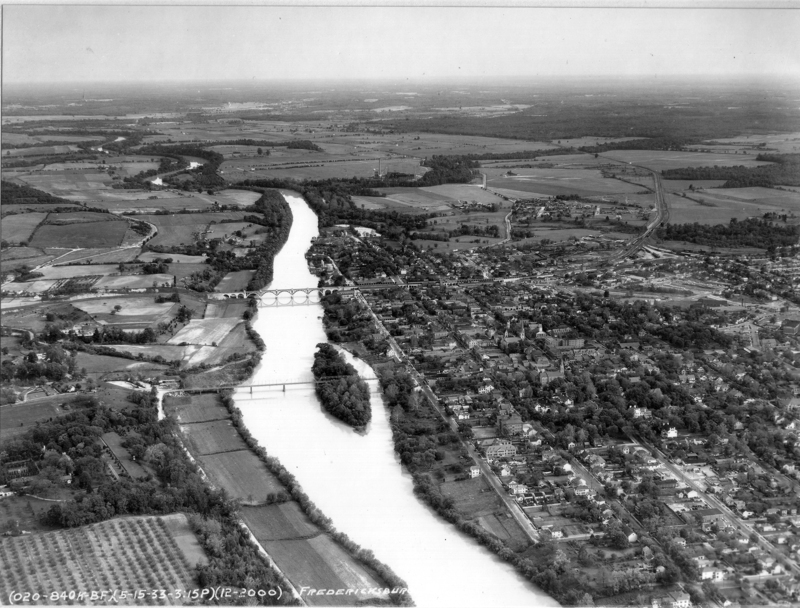 This image offers a view of the Fredericksburg region–one that shows the landscape beyond town virtually unchanged since the Civil War. The image includes the only comprehensive view of the south end of the battlefield we have ever seen. Beyond that, there are hundreds of details worth noting. We’ll get to just a few of them today. The picture was taken over the Rappahannock River looking a few degrees east of south. 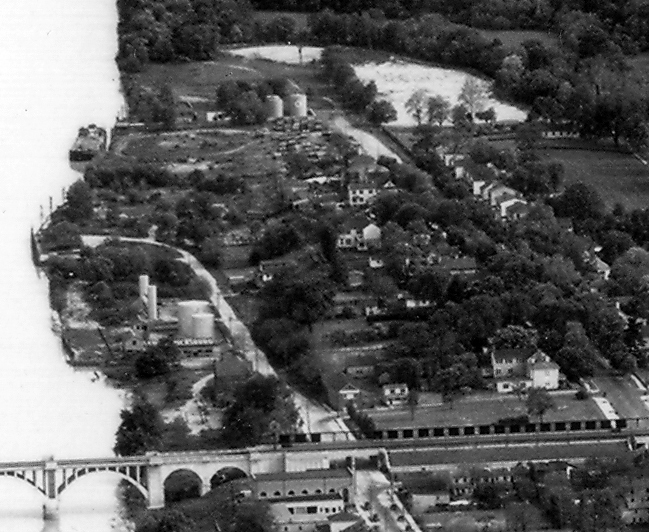 Fredericksburg is to the right, Chatham is at lower left. There are lots of details in the view of Chatham that we’ll talk about in another post. But look beyond, to the south. If you have ever wanted a vision of what the south end of the battlefield looked like in 1862, this is likely as close as you’ll get. We have included a hi-res scan of the image at the end of this post, which you can download and explore yourself. In the meantime, here are the first things that came to our eyes. Click on other images to enlarge them. Here is some detail on the lower crossing site. As many of you who have been there with us in the last few years know, this is now a virtually impenetrable jungle. 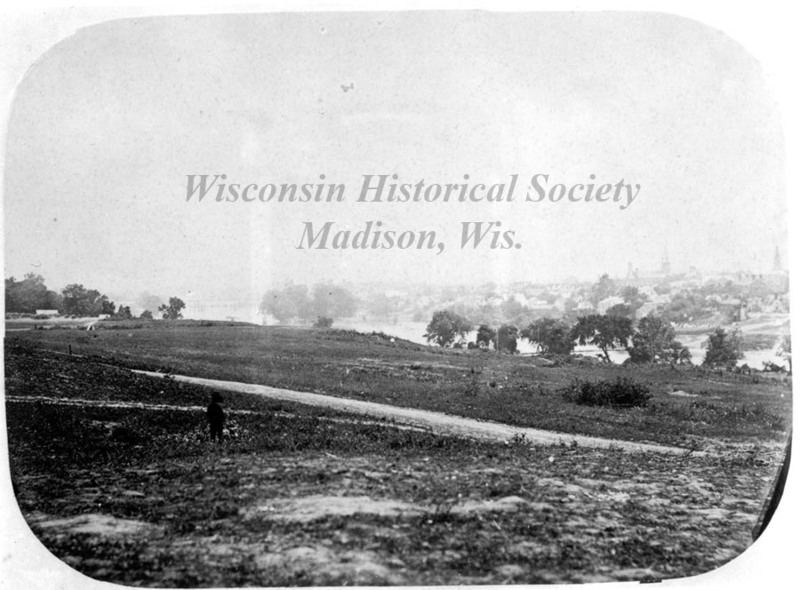 In this view, you can see clearly why the spot was so attractive to Union engineers–a wide, flat area with an easy ascent to the surrounding bluffs. Also in this image is the field much as Pelham saw it when he opened fire from the corner of what is today Route 2 (the historic Bowling Green Road) and Benchmark Road. Pelham’s corner is at the left edge of the photo, the postwar buildings on Slaughter Pen farm at the right edge. One part of this landscape had changed dramatically by 1933. Here’s an enlargement of the city dock–the middle crossing site. 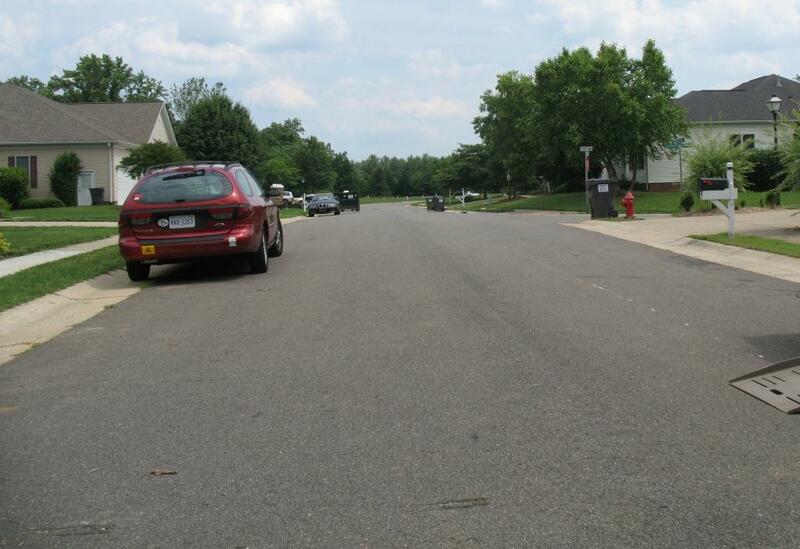 As you can see, it was a vastly different place then, covered with tanks and other infrastructure. The tanks in this view were swept away in the flood of 1942–clearing the way (literally) for a transformation of the area (and, surely, a dramatic rise in real estate values on lower Caroline Street, today perhaps the nicest streetscape in town). There is much more in this image, including Ferry Farm and numbers of buildings in town that are now gone and for which we have no other photographic record. It’s a boon, whether you are interested in battlefield landscapes, the changing landscape at Chatham, or the evolution of a town whose downtown was, in 1933, the shopping mecca for the entire region. We’ll be offering more about it as we get a chance. In the meantime, go ahead and explore the image yourself (a hi-res version is included below). If you spot something interesting, shout it out in the comments. We have only had this image for a few hours, so we’re sure there is much there we’ve not yet noticed. For those of you who were with us, here is an approximation of the ground we covered during our 2011 tour of the lower crossing site. This post is adapted from an article I authored for Volume 10 (2011) of Fredericksburg History & Biography, an annual publication of the Central Virginia Battlefields Trust. 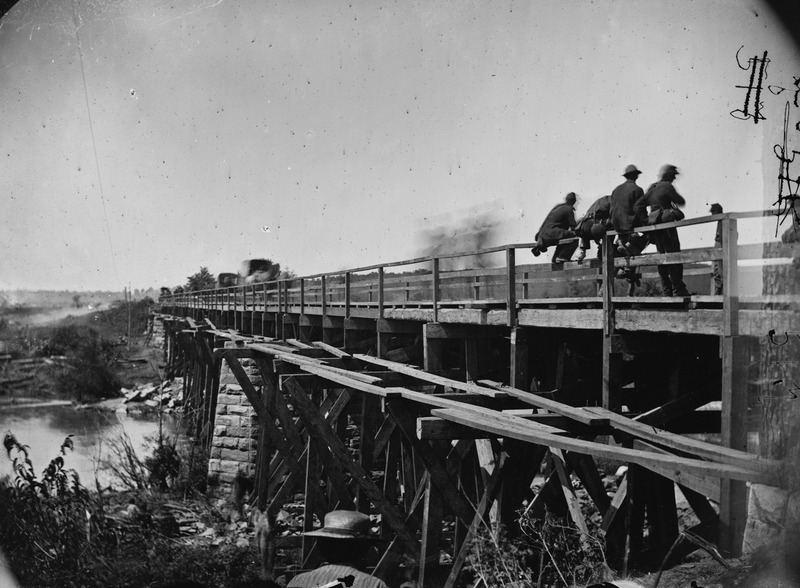 It is nearly impossible to open a book about Civil War Fredericksburg without seeing the photo of Confederate soldiers posing on the ruined railroad trestle along the Rappahannock River. The photo represents one of only two instances in which a Northern artist photographed as his subjects non-captive Confederate soldiers of the Army of Northern Virginia in the field. (The other instance involved Confederates marching through Frederick, Maryland.) That alone makes it an unusual image, yet the ability to identify the previously anonymous soldiers makes this photo even more remarkable. The Union photographer captured this scene from the north bank of the Rappahannock River. The Confederate soldiers stand on the south bank with the river flowing between the artist and his subjects. They are on the literal front line of the war. This is a location that should be hostile, yet the Confederates don’t appear to pose a threat. Their casual pose and the absence of visible weapons suggest an almost friendly demeanor. 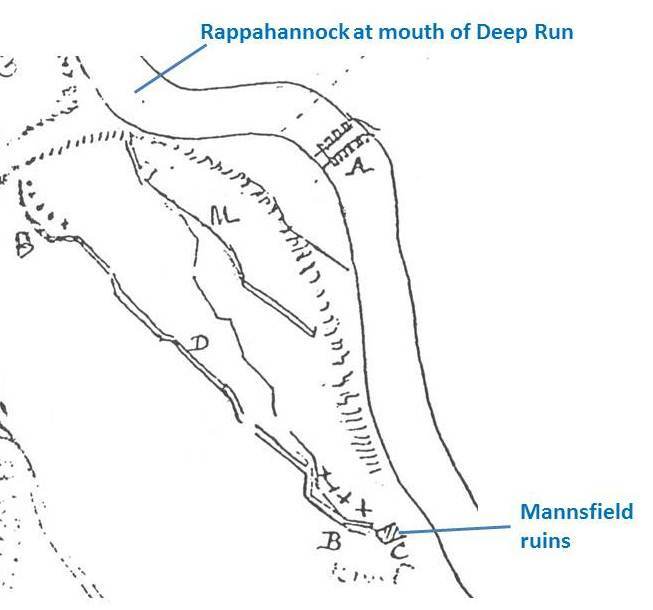 We know that the site of the ruined railroad bridge was a place where the opposing pickets and outposts gathered to fraternize, exchanging newspapers as well as insults. (For an earlier discussion of this location, see John Hennessy’s post here.) 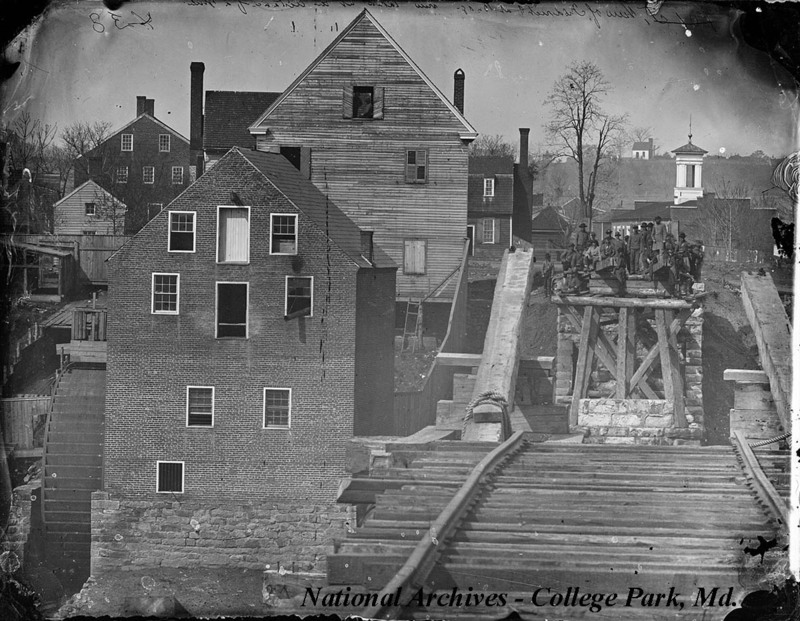 When the photographer appeared at the bridge, we can assume some communication must have taken place between the cameraman and the Confederates. The relaxed gathering at the far end of the bridge suggests cooperation between the man behind the camera and his subjects. Many of us have studied this image in great detail. We know its location. We can see in the distance the buildings, Willis Hill cemetery and defenses upon Marye’s Heights. We even know the name of the photographer – Captain Andrew J. Russell of the United States Military Railroads. (At least one historian has suggested that the photographer may have been Egbert Fowx, Russell’s mentor). What we have not known, however, are the identities of the figures on the far side of the river. We can’t help but wonder who these men are that posed so calmly for a Yankee cameraman along a boundary between the warring armies? To date, no diary or letter has been found, by either a Union or a Confederate soldier, that recalls what must have been an event worth chronicling, or at the very least worth mentioning. The three images taken by O’Sullivan appear (from shadows) to be taken at midday. We cannot be certain of the order, but there are hints. 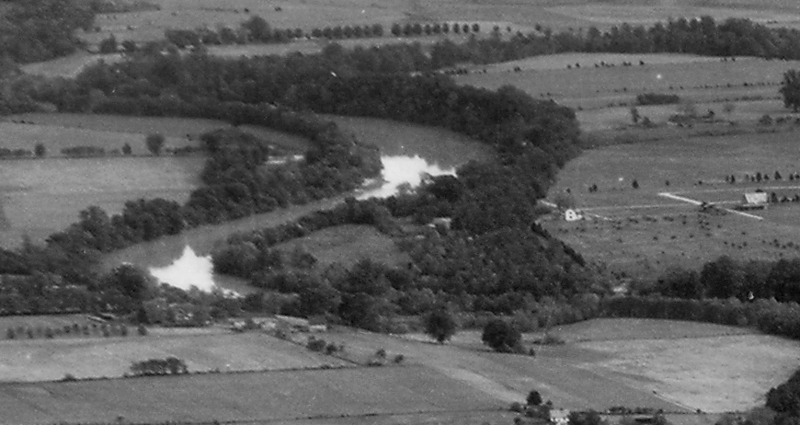 Two of the images are taken from the eastern end, looking westward into Culpeper County. Of these, I would guess the image above was taken first. The traffic in the image is fairly light, the background free of ominous dust clouds. It seems to me that this image might capture the initial approach of the army to the bridge–Nathaniel Banks’s Second Corps (later the Twelfth). To the right, a number of soldiers loiter unaware in timeless poses for young men. 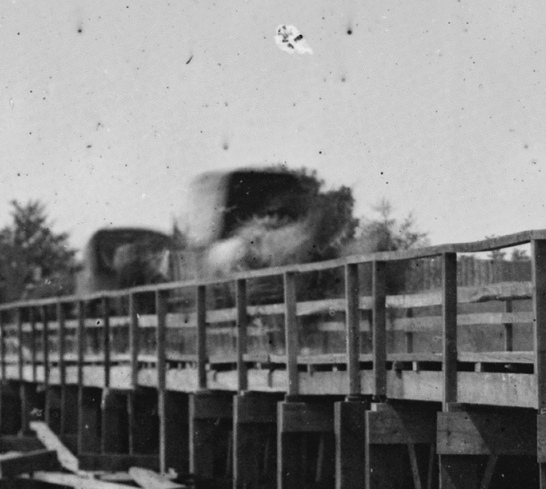 On the bridge are the blurred images of wagons. Based on their profile, they appear to be ambulances (click here for image of ambulances). That would make some sense–the army would likely have sent the sick and wounded back first, and Pope’s army had many in the wake of the Battle of Cedar Mountain, fought ten days before. The second image shows a bridge busy with traffic.